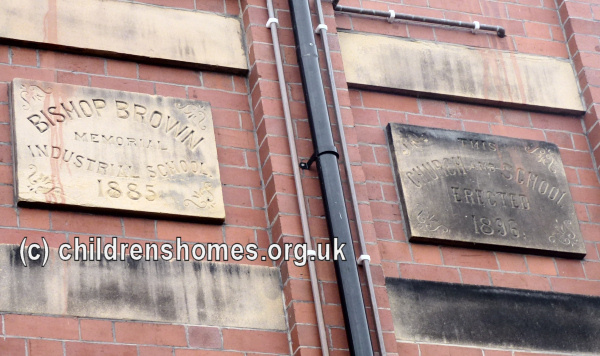 The Bishop Brown Memorial Industrial School was established in 1885 memory of the Right Reverend James Brown, first Bishop of the Roman Catholic diocese of Shrewsbury. 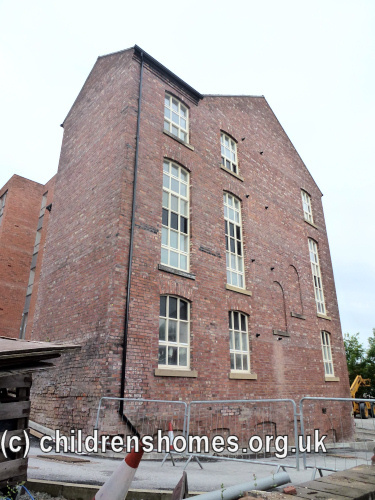 It was intended to provide a boys' industrial school for the diocese which included the counties of Cheshire and Shropshire, and the six northern counties of Wales. 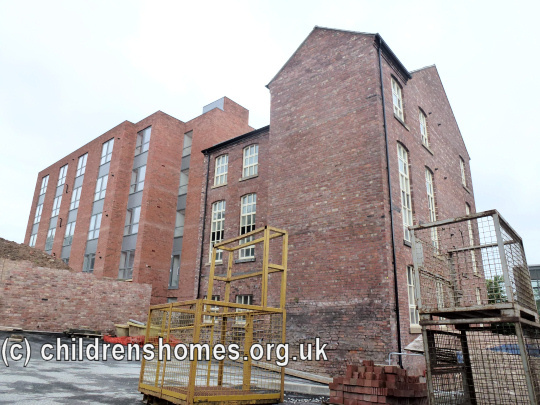 The School was based in an old mansion on the High Street, Stockport, to which extensive additions were made. On September 4th, 1885, the establishment was certified to receive up to 60 boys up to the age of 14 at their date of admission. The School was run by members of the Order of the Immaculate Conception, with Mother Angela (Miss Julia O'Dea) as superintendent, and Sister Josephine as school teacher, assisted by a laundress, cook, caretaker, and occasional visiting tailor. The School site in 1895 is shown on the map below. Bishop Brown Memorial Industrial School for Roman Catholic Boys site, Stockport, c.1895. By 1888, tailoring formed the main industrial training, with the boys making and repairing clothing. Shoemaking had also been introduced, and a School band had been formed. The boys also assisted in the kitchen and laundry and did all the work of the house. On October 18th, 1892, a Working Boys' Home (also referred to as an Auxiliary Home) was added to the premises. It accommodated about 30 boys who were in the latter part of their sentence and were working out, on license, with local employers in preparation for their leaving the School. At around the same date, a new detached infirmary was erected with a workshop below. In 1896, it was reported that physical drill was carried on by one of the officers three times a week. The boys went to the swimming baths in the town and also played football matches at Hillgate. The School library had 56 books, with another 60 in the home. The Catholic Times and some periodicals were read by the boys. Occasional magic lantern entertainments were given, and the Mayor gave an annual dinner for the boys soon after Christmas. The boys camped out for a fortnight each summer at Meols. The trade masters were said to generally be old boys of the School. In 1896-97, a new school room and chapel were erected at the east of the site as shown on the 1898 map below. 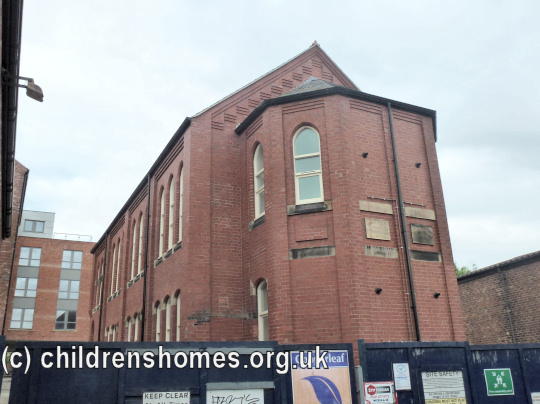 Bishop Brown Auxiliary Boys' Home site, Stockport, c.1898. Sister Angela, who had superintended the School since its opening, left on February 1st, 1908. She was succeeded by Sister Monica (Miss Bridget Haslam). Other staff now included a head schoolmistress and three assistants, a shoemaker, plumber, tailor, bandmaster, drill instructor, home mistress, work mistress, home cook, school cook, and laundress. There were also a visiting singing instructor and visiting dentist. The Auxiliary Home was closed in 1915. A steady decline in the numbers of boys being placed at the School led to its closure in April, 1924.